Affinity Tags, like His Tag, Flag Tag or Strep Tag, which mediate the selective binding to a ligand, are widely used for the purification of recombinant proteins or for binding to functionalized chip carriers. At present, a suitably functionalized surface is necessary for the use of affinity tags. Here magnetic particle binding peptides (negPeps), which bind to magnetic nanoparticles (MNPs) in a controlled manner without a specific surface functionalization have been identified. By altering the buffering conditions the negPeps can be separated from MNPs again. Furthermore, a plasmid system was developed, which enables the expression of target proteins as negPep-fusion proteins in E. coli. Figure:Schematic description of a protein purification process from cell lysate using the negPep-technology. 1.The negPep-fusion pro- tein of interest is expressed in E.Coli. 2.After cell lysis MNPs are added under the respective buffering conditions. 3.MNPs bind to the negPep-fusion protein using the respective binding buffer. 4.Magnetic sepation of the negPep-MNP complexes from the cell debris. 5. 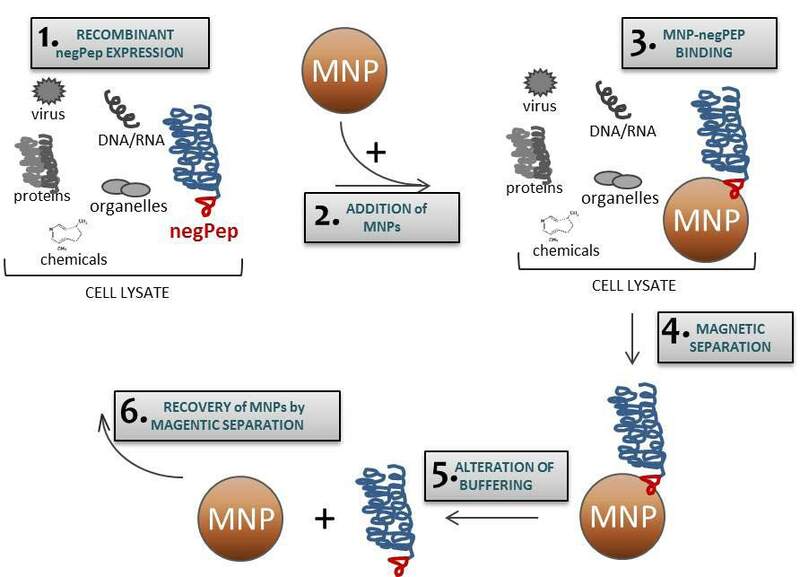 Alteration of the buffering conditions lead to the separation of MNPs from the negPep-fusion proteins. 6. The released MNPs can be recovered by magnetic separation and reused.